Espressif, the company behind ESP8266 (EX) Wi-Fi chip for IoT applications, has now opened store on Taobao, where they sell WROOM-02 and WROOM-02 modules based on ESP8266EX with FCC, CE, TELEC, and SRRC certifications. The company can also provide “hardware reference design, antenna design, and SDK for secondary development”, but you’re likely to find most of what is needed for development, including the SDK, on esp8266.com. You can also checkout WROOM-02 datasheet. Both modules sell for 20 CNY (~$3.22) on Taobao, before shipping, but in due time they should also show up on Aliexpress stores. hmm.. how is this different than the already existing modules on the market. i assume they had to make some changes (like better shielding) to gain FCC approval? Note that the WROOM devices have modular FCC approval. So if you use them in your larger design you won’t need to redo FCC approval. It is important to check that FCC IDs are valid. For example the AI-THINKER module has a big FCC label on it but I have been unable to locate the listing for the module in the FCC ID database. Maybe it is there, but I can’t find it. You will find it properly listed. You need to contact Espressif for volume pricing on these units. Maybe CNX can get a Q1000 price out of them. The $3.22 is Q1. This module is rated 120C which is the highest temp rating I know of on a wifi SOC module. It’s been long four days since your last post and I really missed your interesting topics , I hope everything is OK. I still can not see FCC ID printed on the on the enclosure shield, but maybe this is not necessary (it has to be maybe on the enclosure of your product, I am not sure). Anyway, this goes in the good direction. Thanks Jon for FCC reference number. This will push those esp8266 module vendors out of the market, there are plenty of them. it’s rare for a chip vendor that wants to compete against its downstream module vendors however. the price is unbeatable though. The licensed module must have a FCC ID label on the module itself. • it must be visible on an access panel, door or cover that is easily removed. – Contains FCC ID: bzzzzzzz. Should include the MAC address on that sticker too. But that is not required. Yes, it has been discovered that ESP12 has FCC too. 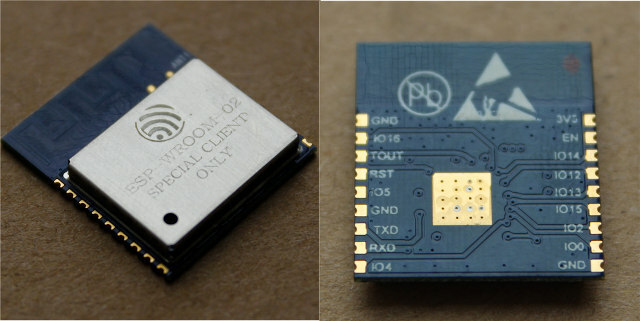 The reason why that took long is that the ESP12 is missing the label the FCC requires. If you look at your link – there is a section entitled “FCC ID Label and Location” where they have included the sticker needed to pass FCC. But then they failed to put that sticker on their production units as required. Because there is no FCC ID sticker no one knew what the FCC ID was. Looking up AI-THINKER didn’t work because the paper work was filed under “Shenzhen Anxinke technology” not AI-THINKER. Moral of the story – put the FCC ID number on your modules, it is required. > Should include the MAC address on that sticker too. But that is not required. Speaking about MAC, I ordered some time ago one thousand of AR9341 routers from a small OEM in Shenzhen… and all the MAC were identical ! (they just “forgot” to make the MAC unique… Not sure how “legal” it is to have a non-unique MAC address, but that can happen ! 🙂 ). I took a look at the schematics of the ESP-WROOM-02 module. There’s no SAW filter between the RF chip and the antenna. That’s not usually a good sign because it may be difficult to pass the FCC and R&TTE tests from 10 dBm up to 20 dBm transmitted power. Power Amplifiers have huge non linearities over 10 dBm which means power transmitted on the harmonics. The only way to filter out the harmonics is to use a SAW filter. Without saw filter the only way to pass the FCC and R&TTE tests is to transmit a lower power level which in turn means shorter distances.